Guess what is the best selling Canadian non-fiction book? Not just best selling hockey book, but all books period. 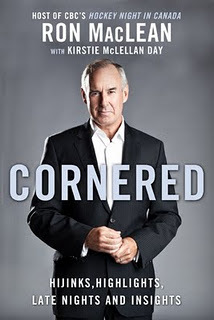 According to The Globe And Mail Bestsellers List, it's Ron MacLean's new autobiography, Cornered. The book is co-written with Kirstie McLellan Day, who has previously topped the list with Theo Fleury and Bob Probert!